I was suppose to post this the other day, but a project came and had to put it on hold. 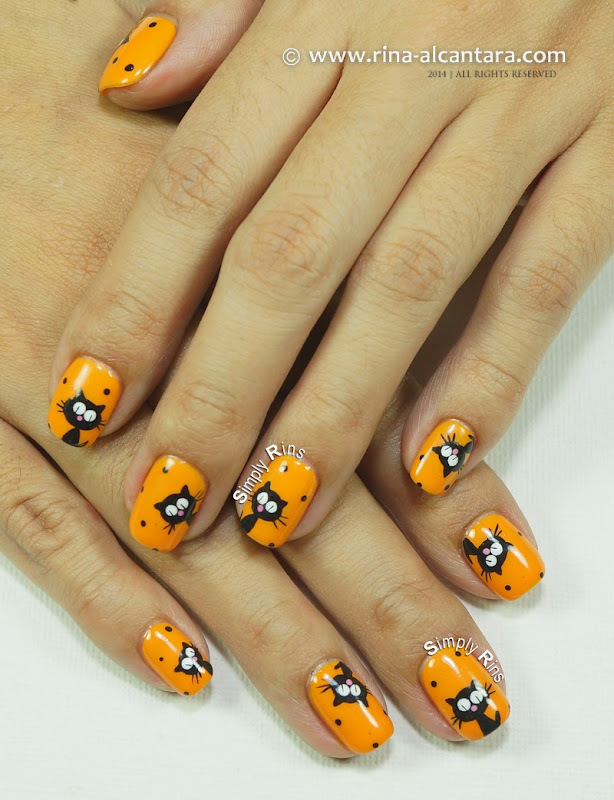 It's my 6th Halloween nail art design for this year. This is a recreation I have been meaning to do that somehow didn't push through until this week. 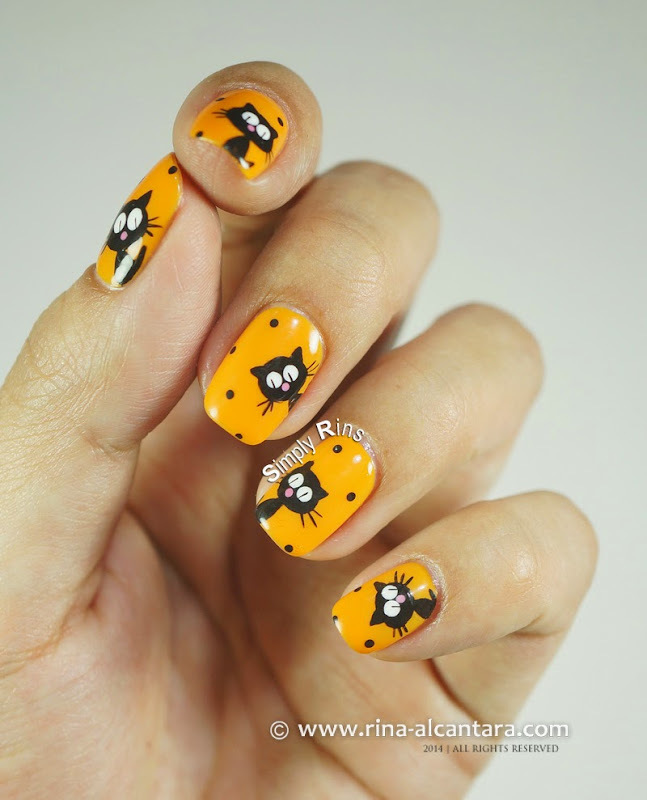 As I mentioned, I am personally drawn to this cat nail art because last July, I adopted a stray female cat. I named her Floozie not because she is. I really just like the sound of it. Turned out, it suited her because I found out that she was pregnant. I thought maybe she was just fat. When I moved in to the new place, Floozie was always in the veranda. She would come to eat then leave. But days go by, she was staying for longer hours until she decided to move in with me. Well, she was very much welcomed. She's a sweet cat. Nocturnal like myself. She gave birth to 4 kittens a month ago. So now, I have 5 babies! I'm not complaining. My pocket is. 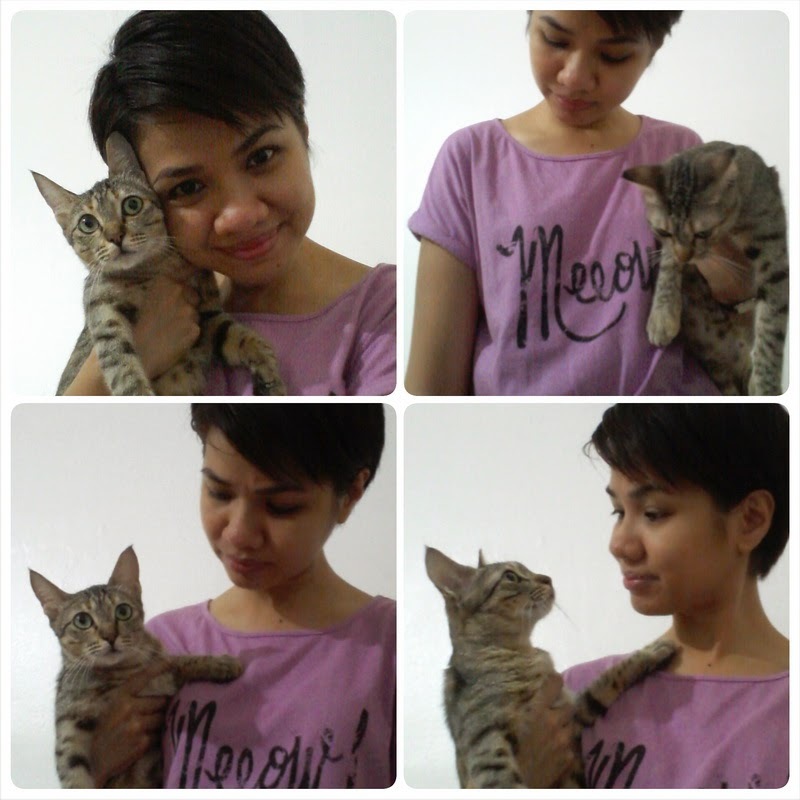 Floozie and I love to take selfies. She's obviously not a black cat, but this nail art is for her and for all the times she would lay beside me whenever I have my monthly cramps. I wanted a bright orange polish for base color and lo and behold, I don't have one in my rack! Yes, I went out to buy one because I refuse to do this nail art with another shade. I found a good one and it's Faceshop OR209. I used 2 coats. Surprisingly, application was a breeze and formula hardly thickened until I finished my manicure. This is a freehand design which I painted using acrylic paints, detail and striper nail art brush, and some dotting tools. I added a few details to this version of black cats. I still wanted a bright background, but I used orange instead of yellow for a more Halloween feel. I like the yellow better though. How about you? I painted the cat slightly different too. The head is still big, but I made a full body that absolutely not proportionate to the head. I painted the eyes bigger and if you noticed, I added a little pink nose for cuteness. I also dabbed a few black dots, also for additional cuteness. Oh, and I painted tails too! I still painted the cats at random places on each nail. But if you prefer to just paint them on your tips, why not! Neon colors as polish base would probably look good as well for this design. Or go classic with simply black and white and let that pink noses stand out. Or instead of dots, draw some cat paws. Now I'm having ideas for the next recreation! 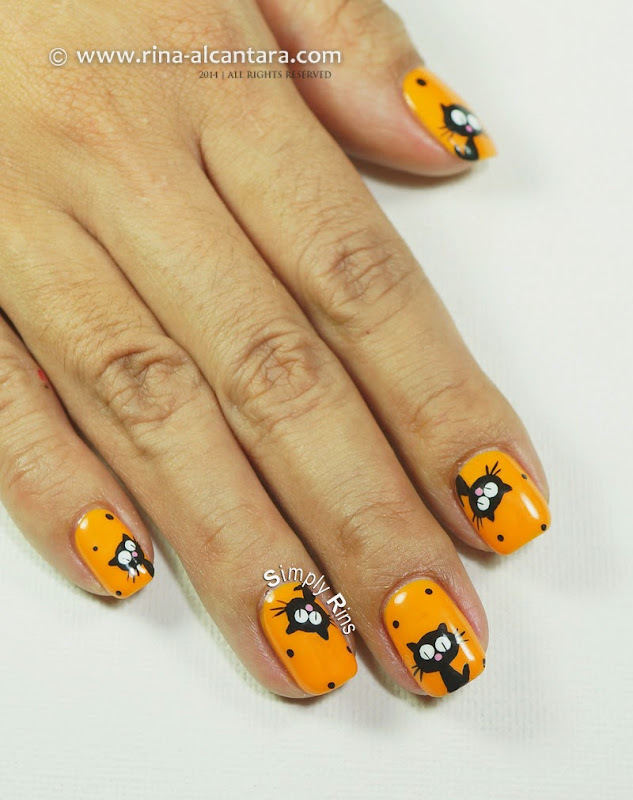 Any thoughts on this black cats nail art design for Halloween? I have 1 more week to squeeze in another or a few more (keeping fingers crossed) themed nail art. Let me know if you have requests or suggestions. Cute cat! 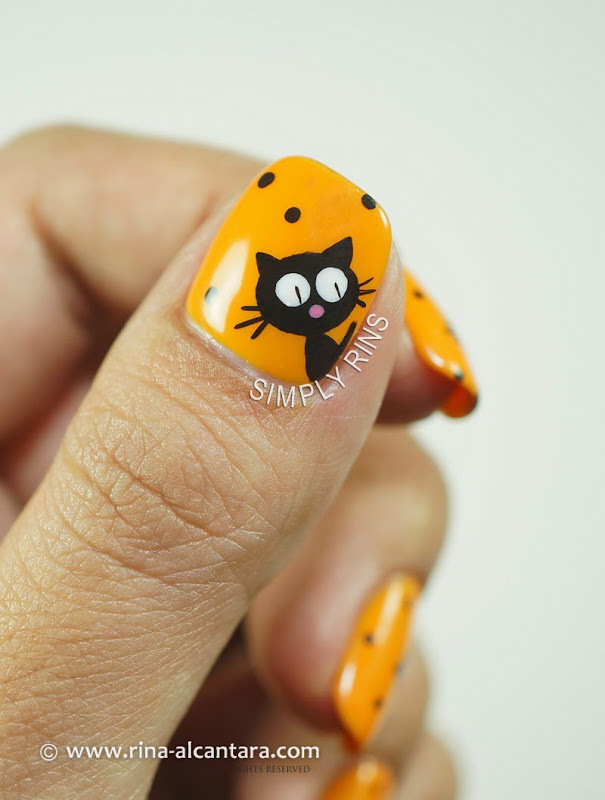 I am a beginner in nail polish land, wish that someday I could draw cat on my nails too!